In chapter 29, Job recounts the blessings God once gave him, believing it was a reward for his righteousness. Job had a good life before God withdrew His grace, the protective hedge around Job’s life. When the Almighty was yet with me (Job 29:2-5). Job’s yearning for the past is not an inaccurate, nostalgic view of the time. Job correctly perceives God’s protective watch over Him (the “hedge” of chapters 2 and 3) and His blessings. Further, Job would not be wrong to see such blessings as a sign of God’s approval of what was in his heart. As David observed about God’s watch over man: “As for you, my son Solomon, know the God of your father, and serve Him with a whole heart and a willing mind; for the Lord searches all hearts, and understands every intent of the thoughts. If you seek Him, He will let you find Him; but if you forsake Him, He will reject you forever” (1 Chron 28:9). If one’s heart is faithful in God such as Job’s and constantly seeking His will, then there is every reason to feel secure in the fact that God’s protective eye is keeping one secure. For, if you “draw close to God He will draw close to you” (James 4:8). s grace (Job 28:28), commenting that it was a “lamp shone over my head…by His light I walked through darkness” (Job 29:3). As the Scripture says, “Your word is a lamp to my feet and a light to my path” (Ps 119:105). Job’s point is clear. He was obedient to God’s admonishment to fear Him and to shun evil. His walk exhibited this understanding. Job’s faith was not nominal, it was substantive. What came with this understanding in Job’s mind? God was with him as a friend (Job 29:5). For this reason, it is important to read this as Job continuing to make his case in light of what he just said in chapter 28. He was faithful and obedient to God, he had by God’s grace become truly wise. So now, it appears, God blessed Job for His piety and smiled upon him. The overall thrust of the chapter is not difficult. He is reminiscing about his life before the present difficulties and how he perceived blessings to be the result of God blessing the faithful. Little does Job know that the way God blesses the faithful often includes suffering. 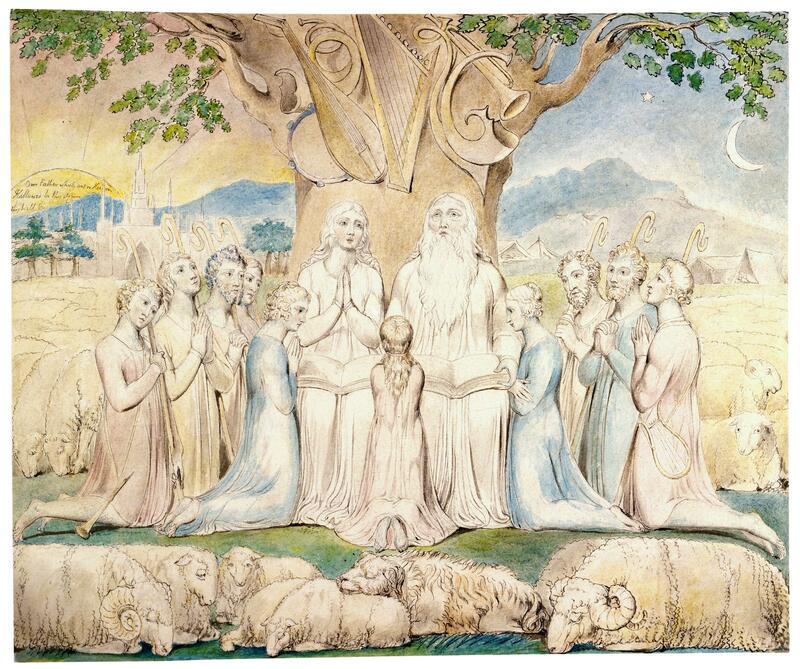 Fow now, Job only understands positive, feel-good blessings and does not know why an all-powerful and benevolent God would expose those whom He loves to anything else. Job reminisces of some pretty obvious things that would make anyone happy. The company of his children (Job 29:5), his old gig as a town judge (Job 29:7), and the esteem everyone of all (Job 29:8-11) because of his righteousness (Job 29:12). Any one of us would miss such things if they were taken away from us, especially in the fashion Job lost them. Job recalls that “my steps were bathed in butter and the rock poured out for me streams of oil” (Job 29:6). Henry views this as a description of wealth. Aquinas and Caryl concur. Caryl goes as far as to say that olive trees planted in stony soil produce more olives, so this points to Job having an abundance to give to others. What these interpreters view, due to the expense of simple things like butter and oil until recent times, is that what Job speaks of is a gratuitous blessing of material goods to Job. We think it is useful to go one step beyond this: with wealth comes ease. Oil and butter are slippery and soft. They convey ease and their flavor makes food easier to swallow. So, what Job is saying is more profound. God gave him a life of ease where he did not have to struggle. The Lord provided for him. Just as Moses got water (instead of oil) from the stone (Ex 17:6), the ease of Job’s life is provided without cost and graciously from a rock. Just as Jesus Christ gives us water that will fully satisfy us so that we will not thirst (John 4:13), such displays of provision point to Jesus Christ and the eternal spiritual subsistence we get from Him. A choice of words that showed wealth in another way, such as fruit or precious metals, would not adequately convey this. God provides for us graciously and for our comfort, which we must ultimately take in Him. What did Job mean when he said, “[B]y His light I walked through darkness?” He was speaking of his Christian walk in a dark world. He had compassion on the poor (Job 29:12-13, 16), he helped those with literal or figurative disabilities sick (Job 29:15), and he acted as a fair judge being fair to the innocent and punishing the wicked (Job 29:16, 17). Job in recounting these things is not arrogant: “I put on righteousness, and it clothed me; my justice was like a robe and a turban” (Job 29:14). The righteousness was not his own, but rather belonging to God and given to him. It is a visual picture of Job being imputed Christ’s righteousness as 2 Cor 5:21 speaks of. We see the same in Revelation in reference to the Church: “It was given to her to clothe herself in fine linen, bright and clean; for the fine linen is the righteous acts of the saints” (Rev 19:8). So, even if the clothing Job speaks of are righteous acts he has done, we should remind ourselves it is given to the Israel of God to do such works. “For we are His workmanship, created in Christ Jesus for good works, which God prepared beforehand so that we would walk in them” (Eph 2:10). It is true then that Job walked righteously, but he put on a righteousness that was not his own but rather God’s–an imputed righteousness of Christ. Job experienced the reality of an alien righteousness, that was not his own. It was given to him to put on by faith (“for we walk by faith and not by sight,” 2 Cor 5:7). Being that we have every reason to be confident because it is not we who stand on our own, but rather God makes us stand (Rom 14:4), Job had every reason to feel secure. He had assurance of his salvation, for as Christ says, “This is the will of Him who sent Me, that of all that He has given Me I lose nothing” (John 6:39). Understandably, he thought that he would live a good life and die in peace (“die in my nest,” Job 29:18). Job felt sustained by God as a plant is by water (Job 29:19). God constantly renewed his strength (“bow”) and upheld him (Job 29:20). Job finishes his speech again recounting the esteem he had as a judge. He spoke with Godly wisdom for he feared the Lord (Job 29:21) and so people waited for his input intently (Job 29:22-23). Job “sat as a chief” and he gave all comfort with his compassionate decisions (and we may infer actions, Job 29:25). The 24th verse can be difficult, but it is useful to read it as speaking of those that Job was make decisions about. He “smiled on them when they did not believe,” as a way of being gracious when they could not believe how sound and fair his judgment was. Their unbelief would be more accurately described as astonishment, that feeling between complete unbelief and knowing something for certain. We have an example of this in Christ’s resurrection. “He showed them His hands and His feet. While they still could not believe it because of their joy and amazement, He said to them, ‘Have you anything here to eat’” (Luke 24:40-41)? The disciples must have had understood on some level that Christ returned, because they were joyful. However, they could not take it all in yet. This sort of feeling is what Job is referring to when he speaks of those who witnessed his righteous judgment. It was an unrighteous uncommon to men. It is worth saying that if a righteous man can garner so much of our respect, how much more should we look towards God who makes such a man righteous? Perhaps if Job understood this, he would have “kept silent” (Job 29:21) waiting for God’s counsel instead of laying accusations against His justice. We will see soon enough, Job will become like his own audience when he is silenced by the greatness and righteousness of God in the latter chapters.